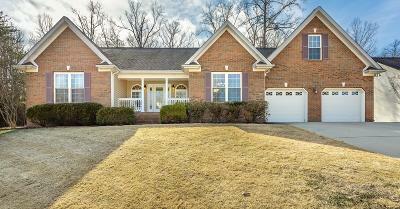 Welcome to 1322 Spitzy Lane, located in Emerald Bay Subdivision, one of Soddy Daisy's most sought after neighborhoods. This meticulously maintained three bedrooms two and a half bath home is the one you've been waiting for. One level living with a split bedroom floor plan, plus a large bonus room or 4th bedroom with closet upstairs. Fresh paint throughout, this home features a tastefully updated kitchen which includes granite countertops, tile floors, refinished cabinets, stainless appliances, and a breakfast area. The formal dining room offers a tray ceiling with a large window, allowing in a lot of natural light. The living room features vaulted ceilings and a gas log fireplace. At one end, the home offers two large bedrooms sharing a recently updated full bathroom with double sinks and granite countertops. The other side of the home has a spacious master bedroom with tray ceilings, updated bathroom, jetted tub, double sinks, granite countertops, and an oversized closet. This home also features a large 2 car garage, with an additional storage closet, a screened in porch with fan, large utility garage which is perfect for storing all your lawn equipment. You'll enjoy the private backyard that sees a lot of wildlife. A Trane HVAC unit was installed in 2013 with a transferrable warranty. The community pool and clubhouse are just a walk away. This is a great home in a wonderful neighborhood. Call to schedule your private showing today!